Day 1. Sunrise-I live in a city so it's hard to get beautiful sunrise shots. Today is a pretty gloomy day too. So the sun didn't even peek out until about 10:00 a.m. So my shot isn't the best "sunrise" shot but it is the sun. I am from the United States and living in NY. Day 2. Before Loss Self Portrait-This picture is very meaningful. Although it just looks like me standing in a kitchen. 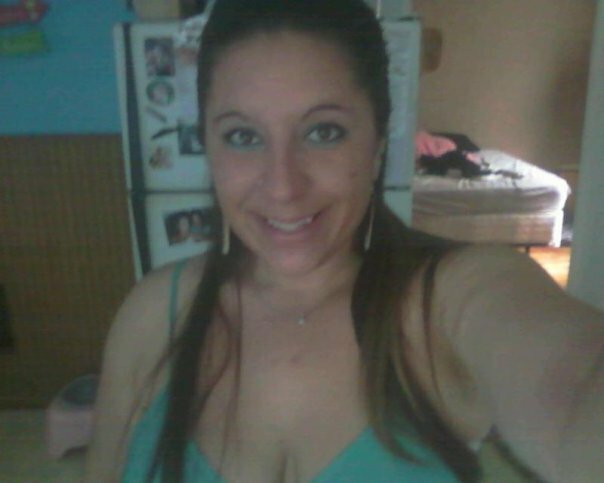 I was getting ready to go to a concert with my boyfriend and friends. I was excited, happy and this smile you see is real. This was a carefree girl that when she smiled she meant it. It is also meaningful because it was the night my angel Gavin was conceived. Day 3. After Loss Self Portrait- Close to two months after Gavin died the annual Italian festival was going on. At the time we lived where it was at the bottom of our street. I had always wanted to live close enough to a carnival that I could walk around it everyday. I love to people watch and just be outside in the sun. Go figure the year it happened is the year I lost my son. I did not want to go at all. Previous years I went and ate all an Italian girls favorite food, rode rides and drank wine slushies. This year I wanted to hide in my house. One night my best friend and her boyfriend decided they would drag Brad and I out whether we liked it or not. This is a girl with a heavy heart, broken soul and that smile is fake. I did NOT want a picture taken but my girlfriend insisted. Day 4. 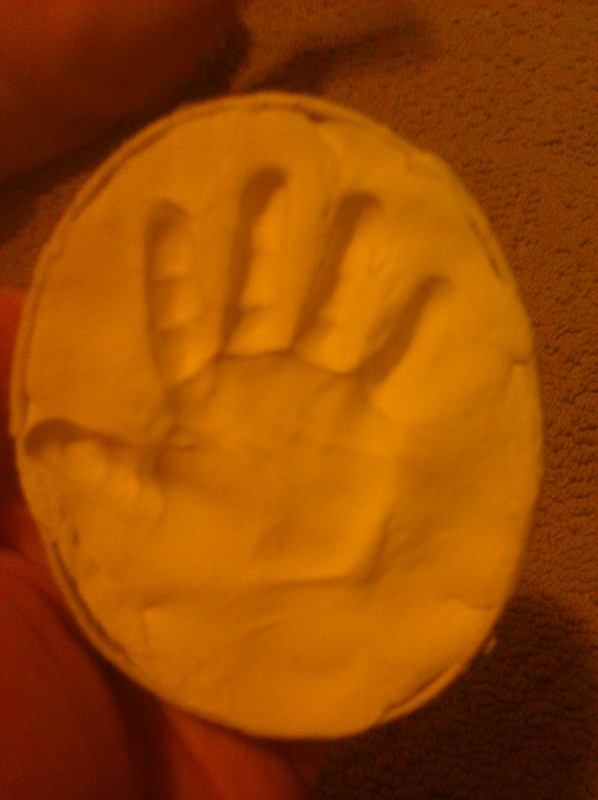 Most Treasured Item- I have a few of these but I would have to say Gavin's hand print is the most important. I take it out when I need a good cry and look at each indent, I touch the finger tips and I wish so badly it was his hand, not a clay mold I was holding. Day 5. Memorial- This is the first charity event/remembrance event my family and I attended. It is called "A Walk To Remember." You want the honest truth? I was so numb at this point I don't remember much of the walk. It is really weird because I have a very sharp memory. 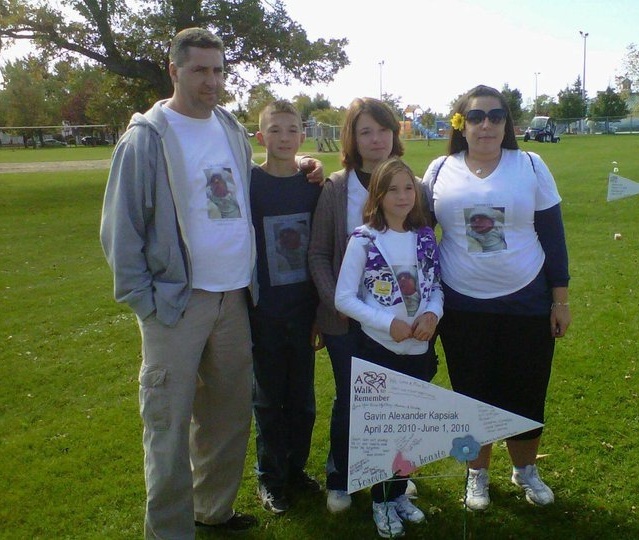 The walk took place in October, 4 months after Gavin died. It was sinking in then that my baby wasn't coming back. That this was my life. Instead of attending birthday parties and events with my son, I would be doing them in his honor. Tomorrow (10/07/12) is the walk again. I didn't go last year because it was very close to my due date of my rainbow baby and I was already a mess. I am a little nervous about going tomorrow but I also know I need some healing.